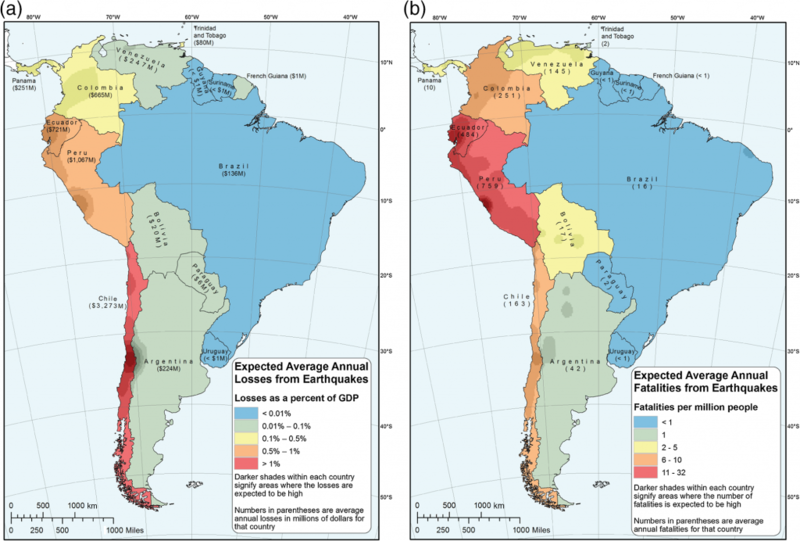 15 May 2018–New seismic hazard and risk models developed for South America suggest that more than 160 million people—about one-third of the continent’s total population—live in areas with significantly elevated seismic hazard, according to a report discussed at the 2018 SSA Annual Meeting. Risk is greatest in the western and northern parts of the continent, where earthquakes and tsunamis have caused considerable loss of life and infrastructure in the past century, said U.S. Geological Survey seismologist Mark Petersen. The new assessments come from a decade-long collaboration between earthquake scientists from many countries in South America and the U.S. Geological Survey that began with a request from the Centro Regional Seismological para América del Sur (CERESIS) to USGS scientists. The results of this study are described in a recent publication in the Bulletin of the Seismological Society of America. The researchers first built seismic hazard models—“using the same methodologies that the USGS has developed over the past 40 years for application in building codes,” said Petersen. These models include new information on subduction zone earthquakes, crustal earthquakes and background seismicity along with the latest ground motion models. The models “tell us where we expect future earthquakes will occur, how often they will occur, and how strong the ground will shake from those earthquakes,” Petersen said. The USGS PAGER model was then used to estimate population exposure, potential fatalities, and economic loss impacts from significant earthquakes across the region. These models are coarse and do not have the detailed inventory and estimates of structural vulnerability that local models might have, but they provide first-order estimates of where the risk is higher or lower across the continent. Finally, the research team developed risk-targeted ground motions for South American countries using criteria that are similar to the performance objectives applied in U.S. building codes. “Experts in South America may have access to more refined information on regional seismicity, faults, and earthquake shaking characteristics; local building code applications should rely on this more detailed information,” he said.